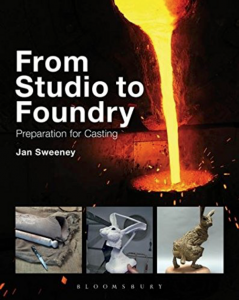 I began teaching a few sculpture courses each summer over 4 years ago. It is nothing smart, only 4 people in my working studio at any time. There is often a vast mix of abilities, often no experience – sometimes a lot! There is always a lot to learn from another sculptors’ way of working, some things may be relevant! 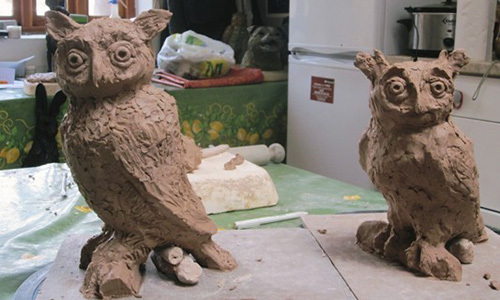 We each start by rolling out a pancake of clay and making an owl, to allow everyone to get used to using the clay (grogged paper clay). Working with a hollow shape, pushing out from the inside and pressing in from the outside, we then build up the already formed shape. Each owl is always quite different and there are lots of illustrations to work from. Then everyone can choose to make whatever they would like using drawings or photos of animals, abstracts and figures. It is important to keep moving forward, I like 2 sculptures a day from everyone, each one will be better than the last and require less help. It helps to not get stuck on one sculpture, better to leave it and move on to another one. It can be anything as long as there are no long thin legs. The clays can all be fired and we will use newspaper, polystyrene and clay props as supports. 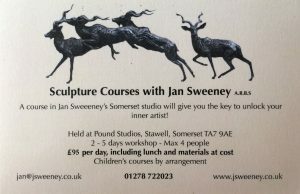 I also do a 4 day mould making course – 2 days of sculpture and 2 days making the mould, pouring a wax and finishing it ready to go to the foundry. This makes it much cheaper to cast a bronze, as the foundry will normally charge for making the mould and the wax pouring. This also cuts out the need to inspect the wax before the casting. There are excellent B&B’s in the village, lunch is provided on the course, all materials are at cost, the clays can either be left to be fired or else taken to be fired at a school or pottery near you. A course requires 3-4 people so group bookings are more than welcome.